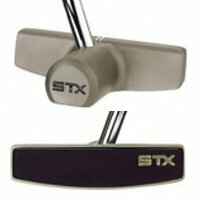 While the STX putter may not be a household name like Odyssey or TaylorMade, they have been around since the 1970s. STX was originally famous for making lacrosse sticks, and the only golf clubs they make are putters. Putter afficionados may well recognise the iconic and strange design of the STX Sync Tour putter (pictured here) which was used by Jesper Parnevik and Seve Ballesteros. Rich Beem won the 2002 PGA championships using one of these rubber faced putters which were all the rage at the time. Today, the mission of the STX golf company is to provide products that "go beyond industry standards and conventional thinking". It's a lofty goal for a relatively small company and I'm immediately suspicious when I see STX's highly stylised advertising - perhaps too much of the budget got spent on the marketing and not enough on the putters themselves? The 2012 STX putter range comprises four different lines so you'd hope that with this much choice, you'd be sure to find one that meets your style and performance preferences. However - be warned - STX putter designs are quite far out there. They pretty much do two styles ... think either IKEA minimalist or extremely futuristic. STX has developed a proprietary technology called F.E.E.L., which stands for Friction Enhancing Elastomer Layer. This special face insert is the softest allowed under USGA and R&A regulations. It's designed to keep the ball on the face of the putter as long as possible to increase the forward spin, reduce skipping, and increase overall feel. Although this is great on perfectly struck putts, some users have felt that the insert also imparts side-spin if your stroke is a bit off, or you catch the ball with a glancing blow. This insert material was developed from the early STX Tour models which had three different versions of the insert with varying degrees of softness. If you prefer a more traditional putter without a face insert, STX has also produced a milled stainless steel option with a unique diamond pattern on the face, more akin to a regular groove faced putter. - The ultimate adjustable putter? The ProFIT STX putter range certain does deliver something unique. This is the most adjustable putter we are Best-Putter.com have come across. You'll find both an interchangeable weighting system, as well as the three interchangeable face insert in these high tech flat sticks. These different weights and face inserts combine to help you adapt to changing green conditions without having to alter your stroke. You'll benefit from the ability to control both how far your putter propels the ball, and this actually does work very well. I saw immediate results with the different inserts. The black insert is for super fast greens, the red is for medium speed and the green for slow, nappy greens. They really do make the ball roll further with the same stroke. The downside is that the feel changes too, which means it would probably take quite a bit of getting used to. Nevertheless, you'd probably be quite well served by this technology if you struggle to find the pace on markedly slower or faster greens than what you're used to. How much you have to adapt your stroke and your perception of the speed of the greens when you change is something only you will know after some trial and error, but our feeling is that a "black today, green tomorrow" type of decision could do as much harm as good. One thing's for sure - experimenting with different combinations of weights and faces is sure to keep you busy on the putting green for a few days! Our only out and out criticism of the ProFIT range is that they're really not that attractive compared with the beautiful lines of a Scotty Cameron, for example. But what the heck if you hole bucket-loads of putts! If all that adjustability isn't your thing, then the Xform line of STX putters might be more to your taste. Although they provide a more traditional design, the alternative STX style of minimalism is still to be found. The main bulk of the head of these putters are custom milled from 303 stainless steel and has a cool satin finish which helps reduce glare so you can focus in on your putt without having to squint even in bright sunlight. You have a choice when purchasing an XForm range putter. You either go for their diamond milling pattern in the steel face or whether to go for an electric yellow soft feel insert. Personally I would go for the former every time. Do any pros use STX putters? You will find STX Putters in a relatively small number of bags on tours around the world, including some on the PGA and Nationwide Tours. The STX Sync Series in the late 1990s and early 2000s represented the high point of the company's tour usage, producing the bulk of their 12 PGA TOUR wins. We wait to see whether their new innovation in style and adjustability can propel them back to these heights.